There are many variables at play when it comes to serving a consistently high-quality takeaway coffee, which can be difficult to control and drive even the most highly skilled barista to the point of frustration. I’ve had many customers over the years ask me why some cafés have very weak tasting takeaway coffee. There really isn’t one simple answer and it can be caused by a multitude of factors, ranging from the blend composition, roast profile of the coffee, the espresso recipe used or even the way the milk is being poured into the espresso. Often it is simply that the espresso shot flavour and strength get lost in the milk due to the size of the takeaway cup being used. A standard dine-in cup in most cafés across Australia ranges between 160mL-200mL which requires a single shot of espresso for there to be a balance between milk and coffee; let’s call this our home cup, or calibrating cup. In my opinion all coffees should chase this strength profile regardless of size so the customer can experience a consistent high-quality beverage every time they come to your café. Now let’s look at a standard small takeaway coffee in most cafés across the country “the 8oz”. A true 8oz takeaway cup should equal 236mL, but unfortunately most of the cups that we call “8oz” are actually equal to 285mL, which is closer to 10oz than 8oz. That means that the barista is using around 80-100mL more milk for small takeaway coffees, using a single shot and expecting them to taste the same as a dine-in cup. As a result, the customer is getting a very milky and weak flavour experience every time they order a coffee to go, which is very different to the experience they have when they choose a dine-in option. The same can be said about your standard 12oz coffee. 12oz is equal to 354mL, but a standard “12oz” that is found in most cafés equals 400mL, which once again is a higher ratio of milk to espresso than our home cup, resulting in a weaker coffee. So how do we get around the issue? Some baristas choose to give a double ristretto shot for their small takeaway coffees, which is a good solution to increase strength in the beverage – but unfortunately you will never really achieve the same flavour profile as the dine-in experience. Ristretto shots tend to present quite salty and sharp, which results in an unbalanced espresso lacking sweetness. But even with this solution in place this still leaves us asking: what do we do with our 12oz takeaway coffees? Detpak, with the collaboration of Veneziano Coffee Roasters have developed a new takeaway cup range to match standard specialty coffee dine in cups, mugs and the addition of a true 8oz, giving baristas a lot more control over flavour, strength, quality and consistency. The Precision Range launched mid-2018 in Australia, and has now been released in London and soon to be in New Zealand. They come in four sizes: 160mL/ 200mL to match dine-in cups/latte glasses respectively, 240mL to replace the generic 8oz takeaway cups and 320mL to match the size of a standard dine-in mug – which becomes your new “12oz” takeaway. These cups are an excellent solution to the consistency problem and are also 100% recyclable and have recently been endorsed by Planet Ark. The easiest and quickest solution to the issue while waiting for your changeover to the Precision Range is to conduct the tests yourselves using your current takeaway cup offering. 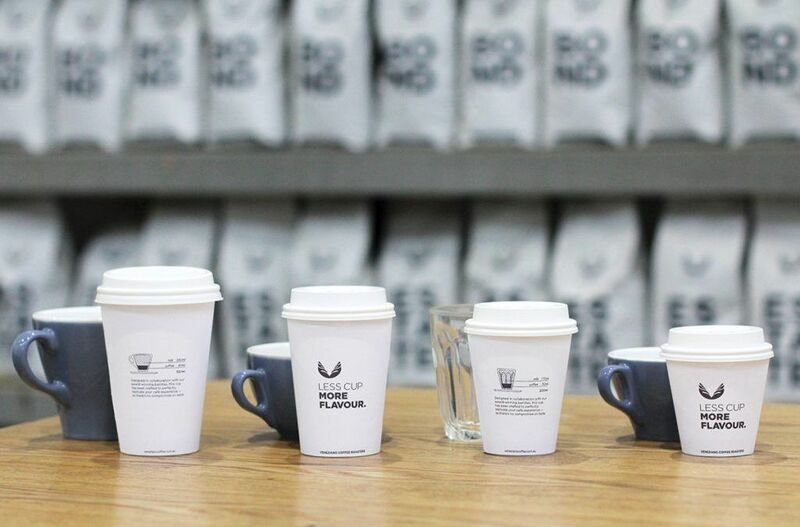 Use your home cup as your calibrating cup and identify whether the shots you are currently giving each takeaway cup size translates to the same strength, flavour and quality as your home cup – if not, adjust accordingly. But remember: this is all dependent on the coffee you are using in your café so taste, taste, taste. The latest issue baristas are faced with when trying to achieve a consistent takeaway coffee is the increased use of reusable cups. No two re-usable cups are the same and unfortunately can be quite deceiving in size, resulting in a very unbalanced experience for the customer. We want to encourage our customers to continue use these cups so we can become a more sustainable industry and reduce cups going to landfill. I have found the easiest way to ascertain what shot should go in which re-usable cup is to use water to measure the cup weight, and therefore volume, when taking the customer’s order. Once you know what shot sizes are required you then need to educate your regular customers on how to order moving forward so they experience the same quality every time. The coffee industry grows at a rapid rate so it’s important that we rise to meet the expectation of the consumer. Remember, when in doubt all you need to do is taste the coffee, it will guide you to make educated decisions around your coffee offering.